Sometimes while chasing our dreams, we actually wind up at a better destination. 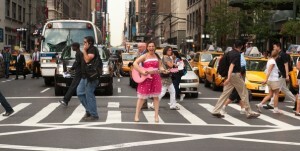 Nina Stone set out for the Big Apple with the intention of launching her musical theater career. What she didn’t expect was to fall in love with the life of a children’s entertainer. Ms. Stone has since transformed herself into Miss Nina, the singing, songwriting, enormously entertaining party host for children’s groups in the New York area. As Nina shares with us her fascinating story, she reveals how pursuing her music dreams led her to find her true calling in life. Tell us about life in the big city! What initially attracted me to the New York area was Musical Theater. I moved here to pursue a career as a singer/dancer/actress, and found myself to not be very skilled at waitressing. So my “survival jobs” generally ended up being some sort of kid-related service—and I LOVED it. So after a few years of performing, I decided to go to Grad school at NYU for Educational Theater. And I have just stayed in NYC ever since. There is a wonderful, supportive Mommy Culture here. A couple of groups come immediately to mind like Mommy Bites and Big City Moms. These organizations offer weekly luncheons and/or outings for moms new moms and expectant moms and a lot of new moms meet this way and then form their own mommy friendships and playgroups that meet once a week or so. This “Mommy Culture” presents the perfect opportunity for entertainers such as myself to hook up with these new moms and entertain at their groups. These groups often start with children 6 months old, as “playgroups” that give the moms and opportunity to chill and socialize a bit, as well as provide music and games to connect with their babies. And then time goes on and the kids get a little older, moms go back to work or have second children and the groups develop into music and play classes focused on the children. I have a really cool thing going on right now where I have one group of 2-year-olds and their moms & nannies who I’ve taught since they were 6 months old. And in the fall they will all start preschool, and I will be starting another group with the same moms and their second children! Very cool. I think the biggest challenge I come up against is space. Often I have interest from people to do a group, but no available space. (And what makes doing playgroups a wonderful thing for an entertainer is that one doesn’t have the overhead costs of renting a space.) Typically, we might switch apartments from week to week in a group where everyone takes turns hosting, or if everyone lives in the same building there is often a “party room” that is available for them to reserve, and we use that weekly. But sometimes there’s no party room, and no one has an apartment with enough space for a group of 10 kids and 10 adults. Figuring that out is always a challenge. Well, as I mentioned earlier, I was originally pursing a theater career and I got this job at a place called WonderKamp. It was an indoor kids’ play space that had everything from a huge indoor climber and ball pit, to a karaoke room, to arts and crafts. I would lead a different activity every 20 minutes: acting out a story on the Main Stage, Leading a kids’ dance party, etc. On weekends I’d lead a Birthday Party or two. I LOVED this job, so much so that when I was out on my first professional theater gig in Europe doing 42nd Street, I actually missed my day job! So over the next few years, I continued performing in theater and also started teach drama class here and there, dance classes here and there (WonderKamp closed, sadly). Eventually this all lead me to getting my Masters Degree after which I worked for some great companies as a Teaching Artist and eventually found myself at Gymboree Play & Music as a teacher. I remember one Saturday morning, sitting in a class full of moms and dads and their kids, leading them in a round of Old MacDonald and I thought to myself, “THIS is awesome. Is there any way to do specifically THIS with my life?” The feeling of community and love and fun was infectious and wonderful. So, I worked at Gymboree for a few years and would also entertain at their Birthday Parties on weekends. And when I left there to go teach at a preschool, I started getting calls where people would ask if I would come sing a their child’s birthday party. And I remember being psyched that people wanted me to do this, but had no idea how to go about it. At that point I didn’t play guitar, so I bought some shakers and some scarves and started creating a 45 minute kind of music class party. The more I did it, the more I loved it. Eventually I bought a guitar and started learning some basic songs, and just started developing my “thing” more and more. I know you draw a lot of inspiration from popular children’s stories. What else inspires you to write your songs? Do you follow a particular method when composing? It seems like they always come to me in a different way. But one thing I found is that melodies and/or rhythms often come to me when I’m walking. And I’ll have to stop and get out my phone and sing the melody into my voice recorder so I don’t forget! So, from this I have created a discipline of song writing that involves going for a walk and then setting aside time to write. I decided to dedicate my most recent Spring Break to songwriting for my upcoming CD. And my “method” was to get up and go for a walk in the park, and then come back and spend two hours writing. It didn’t have to be monumental. It might be writing lyrics or fooling around with rhythms on Garage Band…but I just made it a point to set aside 2 hours, no matter what, to show up for songwriting. And I definitely had 3 songs come out of that process. As for inspiration: it’s really the kids and parents. I am fortunate to work with young children daily and I get to see what delights them, what they struggle with, what they like to hear. I don’t necessarily write for them in a prescriptive way, but being in touch with them on daily basis definitely informs what I create. Singing and dancing! I mean how many jobs are there that you get to sing and dance all day?! And I love creating an environment of fun. As adults we often lose touch with of the importance of having fun and even HOW to have fun – and I love watching a group of people relax, loosen up and have fun with their children and with each other within 45 minutes. I can’t fully put it into words – but it really feels like a blessing to be able to do that and I often find myself in the midst of a playgroup or party just feeling so grateful. What’s your least favorite? Be honest! The nature of what you do is so dependent on your cheerfulness. How do you manage to stay positive each day? What do you do when you feel down but have to put on a good show for your clients? Wonderful question! Self care is so, so, so important. And although I’m not really the Queen of Balance, I strive to be. It’s definitely difficult to be positive if I haven’t had enough time for myself. When I’m all filled up – have had enough sleep, time with my husband, have worked out, been eating well, had time with friends for some fun, I feel great and am overflowing with positivity. And that’s the best place to give of myself from! So, I try to be sure and get enough sleep, to follow great nutrition, work out daily, and be sure I’m enjoying my life. However, when I’m a little deficient in these areas, how do I manage to stay positive and what do I do when I feel down but have to put on a good show? Honestly, music and singing really is the best antidote for when I’m feeling bad. Making music and being with children require that a person be 100% present, and often for me, that’s the way out of myself: getting present and putting my focus on serving others. And then also…..there’s something about singing. I don’t know if it’s the vibration of sound in the body, or an endorphin release or what….but singing, especially children’s songs, always makes me happy, no matter how I was feeling before I started. Do you find it challenging to market to both children and their parents? How do tackle this challenge? I’m really just starting to understand this important distinction now. For the past few years, aside from Miss Nina LLC, I have also taught a mommy & me program at a private preschool. Miss Nina LLC often benefits from meeting families through that program. At one time I simply thought that if the children liked me then the parents were sold. And this is partially true. But sometimes the children attend class with a nanny and no matter how bonded me and their child are, the parents may never really know or understand (or care about) that. I mean, generally speaking, if a child is enjoying something it makes the parent wildly happy. But as I now venture out to widen my audience I am learning that, well, the kids may love me, but they don’t have wallets! So, I HAVE to market to the parents and have a love affair with both of them. I am very much about the children. There are some kids music artists out there who are more about entertaining the parents with kid appropriate material—which is also a wonderful, wonderful, thing. But for me, my passion is really in creating a joyful experience for children through music and movement. So, I’m learning to create for the children, but to market and speak to parents. It’s definitely tricky. But getting this clarity about myself is very helpful. And getting clarity about what’s important to parents makes it easier to market to them, because, really, we both want enriching, joyful experiences for their children. What do you find children respond well to in your work? How about their parents? Yesterday, I just got a comment on one of my videos from a parent. She told me her baby loved my videos but asked if I could “do more silly movements and noises like I had done in Row, Row, Row your Boat” because her baby loves that. So, although I love to work on developmental themes, and create great songs, children LOVE my silliness! We may do a song slow and then “super silly fast”, and they just love it. That mom is 100% on target; anything with silly movements and noises are great. I mean, kids love slapstick. But here’s one the thing that my clients have told me they respond to: I do not patronize or talk down to the children. I don’t speak in baby voices or pander to them. And that mix of regular speech and silliness seems to be the perfect combination. They also love my book songs. It’s amazing to see a group of kids riveted to a book while I sing it. I think their parents respond to the same things. I think, again, they feel comfortable with me because I’m—well, real, and don’t pander. I think they love that I get their kids to laugh and that I get them and keep them interested in books and reading. I also think the parents and I like each other and respect each other. I know they appreciate that I have a structure to my group, but that I’m flexible and understand that moms need the playgroup time to socialize, too. 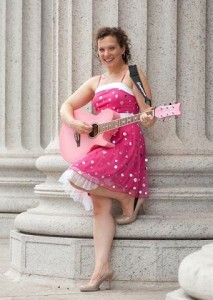 And of course, we can’t forget the pink guitar! The kids really do love it. What is the future for Miss Nina? What a big, exciting question! So first, in the very near future I hope to offer an online playgroup so that I can reach and connect with people in other areas outside of NYC. Beyond that, as I finish recording this next CD, my dream is that it has very wide reach, and that I may have the wonderful experience of playing my music at concerts and big venues all over the country. I love what I do, but at the moment I work A LOT. I reach small groups of people several times a day. So, I would love to be able to reach larger groups of people all at one time, enabling myself to work less hours on the daily! What advice do you have for students considering a career in children’s live entertainment? Hmmmm… I think it’s really important to understand the children you aim to entertain. If you study primarily music, or theater, be sure to take a course or class or at least research a bit of child development. It will help you in planning activities and how to engage the kids you are entertaining. And buy a microphone and amplifier! I know that sounds really silly – but I found that using a microphone at kids parties really switches the dynamic from free-for-all to performance, gives you an appropriate amount of command, lends to a sense of occasion to the event, and will save your voice! Nina Stone’s love for entertaining children shines through her Miss Nina persona. Her sparkling personality delights kids at her parties as well as their parents. Though her musical journey has taken her to a much different place than she had originally anticipated, Nina is happy with her career and has never looked back in regret.